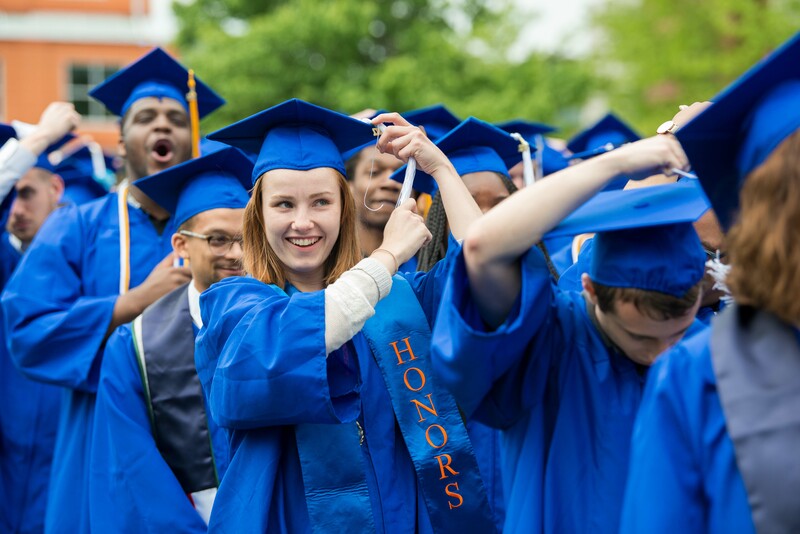 At the culmination of their undergraduate careers, SUNY New Paltz’s newest Liberal Arts & Sciences graduates received their degrees before an audience of their families, friends, faculty mentors and College staff at the Saturday Undergraduate Commencement Ceremony, on May 20. 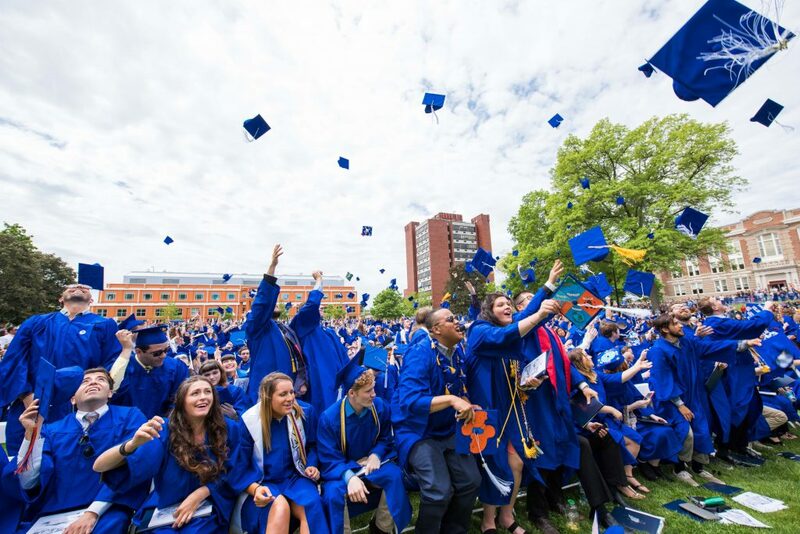 Nearly 2,000 total undergraduate degrees were distributed over the course of a two-day Commencement weekend on the New Paltz campus, as students representing the graduating classes of August 2016, December 2016, January 2017, May 2017 and August 2017 took advantage of the once-in-a-lifetime opportunity to don cap and gown and be formally recognized for their hard work. The participants at the Saturday Ceremony spent their time at New Paltz developing expertise in a wide array of fields and subjects, including psychology, English, digital media and journalism, Black Studies, communication disorders and economics. These newest alumni of SUNY New Paltz hail from diverse backgrounds and are looking ahead to a variety of career, graduate school and life paths, but will forever have this place and this time in common. 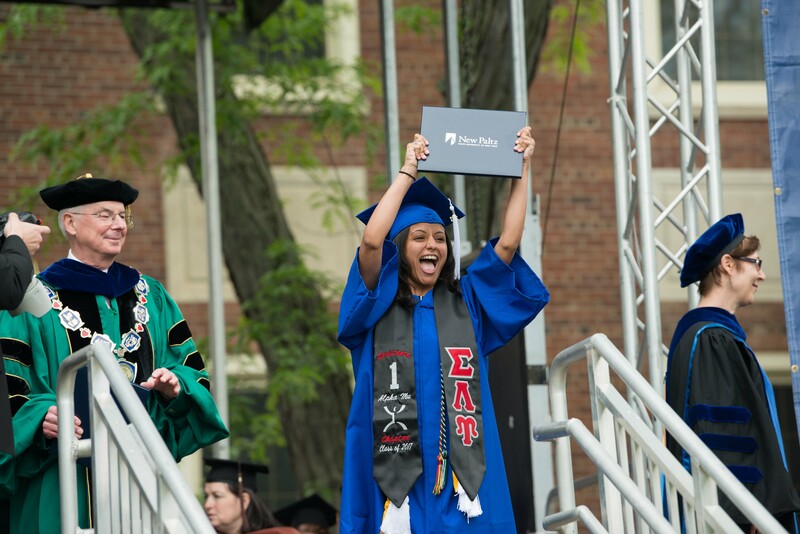 “This ceremony is a centuries-old tradition to formally and joyfully acknowledge the close of one chapter in our graduates’ lives and the beginning of the next,” said President Donald P. Christian. “In a few moments, today’s graduates will no longer be our students. Instead, equipped with the intellectual tools, habits of mind and inquisitive spirit they’ve developed at New Paltz, they are embarking on the next stage of their life’s voyage. The Commencement Address at the Saturday Ceremony was given by New Paltz alumna and United Nations Assistant Secretary-General for Latin America and the Caribbean Jessica Faieta ’85 (Economics/Business Administration), who shared insights from a truly international career that began when she left her home country of Ecuador to enroll at New Paltz. “Some 30 years ago, I was standing in your shoes, on this same lawn, wearing the same cap and gown,” Faieta said. “When I look back, my life and career feels so unexpected – so full of turns and twists, victories, but also many mistakes. Careers are about trial and error, about taking risks, about perseverance, and about taking pride in every small step that you take. Student Speaker and Salutatorian Jonathan Baez ’17 (Communication Disorders) of Monroe, N.Y., offered his peers some valuable perspective before they stepped to the stage to formally accept their degrees. “It’s always good to have a plan, and a strong work ethic has rarely betrayed the one who employs it,” Baez said. “But it is important to remember that even the best laid plans may not pan out. Even in those spaces when life doesn’t quite go as you’d like, allow yourself the experience of what comes your way, because a full life is one in which every minute has been thoroughly inhabited. In the anticipatory moments just before the ceremony got underway, a few grads-to-be took a moment to reflect on their time at New Paltz, and gain some perspective on the magnitude of what they have accomplished. 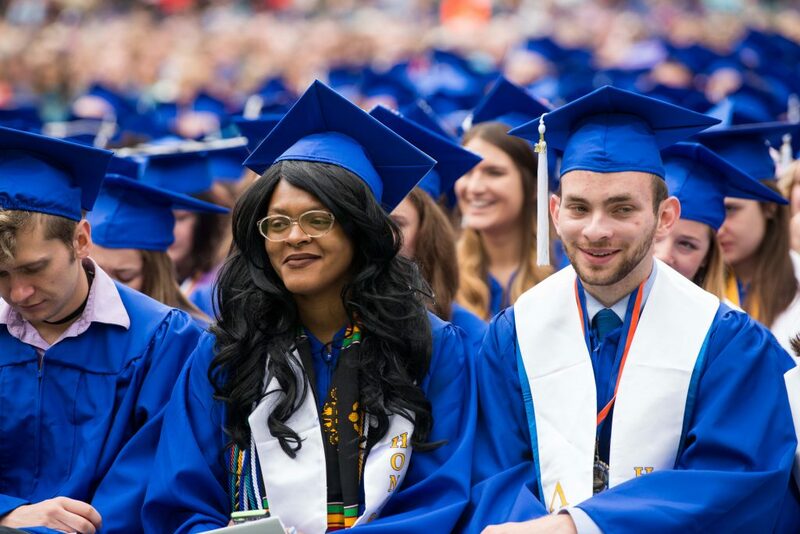 The Saturday Ceremony was part of a weekend-long celebration of New Paltz students’ academic fulfillment, as more than 2,500 graduate and undergraduate degree recipients were honored at Commencement ceremonies held on May 19, 20 and 21.